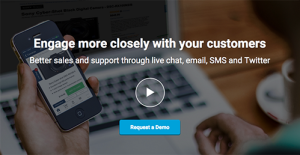 BoldChat offers live communication software including chat, email management, and click to call tools to help businesses control customer interactions and boost website sales. The vendor offers a flexible suite of features that clients can customize and manipulate for their specific requirements. BoldChat Pro includes a rules-based proactive chat engine to help websites drive more conversions and conversations. From an integrated work queue, customer support executives can interact with website visitors through live chat, Twitter, email, and SMS texts. BoldChat live chat technology provides small snippets of HTML that need to be pasted on your website. This makes the BoldChat live chat available on your website. All BoldChat products share a common infrastructure, so if you decide to upgrade there is no need to redeploy anything. BoldChat is ready when you are. BoldChat offers robust features such as tailored pre- and post-chat forms, customized chat windows, and proactive invitations. The vendor offers both scalability and reliability with 99.99% uptime. BoldChat offers features such as a robust proactive chat rules engine, an integrated workspace UI, co-browsing, and adaptive messaging to facilitate agent speed and efficiency to help deliver a good visitor experience. Users can make the changes required to their own deployment and the vendor offers reliable customer support. Each business is different, and may require a special Customer Support Software solution that will be adjusted to their business size, type of clients and employees and even individual niche they cater to. It's not wise to count on finding a perfect services that is going to be suitable for each business regardless of their background is. It may be a good idea to read a few BoldChat reviews first and even then you should keep in mind what the solution is intended to do for your company and your employees. Do you need a simple and straightforward service with just basic functions? Will you actually make use of the complex tools required by pros and large enterprises? Are there any specific tools that are especially beneficial for the industry you work in? If you ask yourself these questions it is going to be much easier to find a trustworthy app that will fit your budget. How Much Does BoldChat Cost? We realize that when you make a decision to buy Customer Support Software it’s important not only to see how experts evaluate it in their reviews, but also to find out if the real people and companies that buy it are actually satisfied with the product. That’s why we’ve created our behavior-based Customer Satisfaction Algorithm™ that gathers customer reviews, comments and BoldChat reviews across a wide range of social media sites. The data is then presented in an easy to digest form showing how many people had positive and negative experience with BoldChat. With that information at hand you should be equipped to make an informed buying decision that you won’t regret. Its reporting functionality is superb. The UI needs a lot of work. Basic yet effective in a lot of ways. We're utilizing BoldChat for vistors/users who want to thrown in questions on our site. What are BoldChat pricing details? What integrations are available for BoldChat? Pros: Compared to other third party services, BoldChat is simply great. It lets a user look into varying aspects of essential formation on the customer they're currently chatting with. These inclde personal details such as phone numbers, e-mail, question, name, and etc. Through BoldChat there's no need to have a customer rep constantly asking "How may I help you?" Cons: I was hoping there's an easier approach in acquiring data. It's a bit hard to look into items in places where they shouldn't be. Further reporting functionality would be nice. The same goes for its reporting. Pros: BoldChat is a decent app to work with. A bunch of things that I like about it. One its standouts is its reporting. It's simply great. Cons: Terrible UI. Worse, it goes through a lot of bugs. It does its job. It works great for the company we're running. Process of installation was a cinch. It was that easy. BoldChat is a decent app to work with. A bunch of things that I like about it. One its standouts is its reporting. It's simply great. The software is simple to utilize. In general, it's really reliable. It's capable in meeting the needs of any business. It does what it's meant to do. BoldChat is one example of a product that works. It's simple to work with. What's more, it's effective in what it does. I use it regularly and gets the job done. User-friendly and customizable software. I use this software every day and it’s really helpful. If you need more information about BoldChat or you simply have a question let us know what you need and we’ll forward your request directly to the vendor.